EVEN before former President Olusegun Obasanjo came out to demand a youthful president as the way forward for Nigeria, the search for the flag bearer of the Peoples Democratic Party (PDP) in the forthcoming Presidential Election has been intriguing. This is mainly because of the opposing interests and avalanche of powerful aspirants desperate to pick the party’s ticket.Given that most of the serious aspirants are old political warlords, the party’s dilemma over the choice of its presidential candidate has been further deepened by the current campaign for younger leaders, The Nation investigation confirms. It would be recalled that during the 2015 General Elections, the then ruling Peoples Democratic Party (PDP) practically closed its doors against would-be presidential aspirants as it made it clear to all and sundry that it would not allow anybody to drag the party’s presidential ticket with the then incumbent President, GoodluckEbele Jonathan. Today, that decision is one of such, that many commentators, within and outside the party, have blamed for the landslide defeat of the PDP in that year’s general election. After the blinding loss to the All Progressive Congress (APC) then a budding mega-party peopled largely by individuals and groups opposed to the continued presidency of Jonathan, the PDP was thrown into chaos as it struggled to keep its house in order. The self-acclaimed biggest political party in Africa moved from one intra-party leadership wrangling to the other until it was rescued by a Supreme Court judgement last year. Perhaps determined to right the wrong of the past, the PDP promptly held an elective convention where new leadership was given to the troubled party. Though controversies and threats of fresh crises trailed the convention, it appears the Prince UcheSecondus-led National Executive Committee enjoys the support of major organs and stakeholders within the party. Thus, it has been making efforts to move the party forward against all odds. Pundits have been applauding the new leadership, especially after it successfully managed the biggest post-convention threat to the party’s unity. A group of aggrieved chieftains had after the convention last December announced the birth of a new faction of the party called Fresh PDP. The promoters had promptly announced a parallel Executive Committee and secretariat. In a manner many still say is unusual of the PDP in its hey days, the national leadership of the party for weeks, engaged the Fresh PDP in series of dialogues and meetings even as the publicity unit of the party refused to be dragged into verbal or media wars with the new faction. After weeks of consultations and dialogue, the Fresh PDP announced its decision to fuse back into the PDP and end the factionalisation of the party. Announcing this decision after a meeting with a former National Chairman of the party, ‎OkwesiliezeNwodo, in Abuja, Chairman of the ‘Fresh PDP’ OlukayodeAkindele, said the party is bigger than any individual or group, stating that it was time for a ceasefire. “I am delighted to tell you that we have collapsed into the mainstream PDP. We have assurances from our leaders and we will not have a parallel NWC on Monday,” he said. However, as the PDP revels in the success of its management of the threat posed by the defunct Fresh PDP, pundits and inside sources say the party is currently in a dilemma over how best to handle the emergence of its presidential flag bearer for the 2019 General Elections. Still aching from the many errors it allegedly committed while undertaking the same assignment in 2015, the party says it is determined to get it right this time. Indications that the party may not find it easy arriving at the choice of who to present as its presidential candidate in 2019 emerged immediately after its elective National Convention, held in Abuja last December. Party sources claimed some developments at the convention altered certain permutations on ground and introduced new dimensions into the ongoing search for PDP’s presidential flag-bearer. “The ease with which the controversial ‘Unity list’ sailed through at the much publicised convention rattled some powerful blocs within the party. It also introduced a new fear; the fear of the possibility of a group imposing a candidate on the party. Similarly, the convention also reinforced earlier fears that some deals may have been struck among some chieftains concerning the 2019 presidential race. Former Anambra governorship aspirant on the platform of the party, KodilichukwuOkelekwe, indicated possible happenings within the PDP when he warned that his party will lose the next presidential election in 2019 if it fails to pick the right candidate. He said while the odds currently favour the PDP ahead of the 2019, the party may lose the opportunity if it repeats its mistakes of the past by picking the wrong presidential candidate. “I am advising my party, the PDP. I am saying clearly that we must make sure that we choose the right aspirant as our presidential candidate. 2019 presents us with an opportunity to return to power. The election is ours to lose. Once we pick the right presidential candidate, Nigerians will overwhelmingly return PDP to power. We can see that APC was not ready for governance. They were more interested in taking power but they have no blue print for governance. Governance is a serious business and PDP, we have done it before. We have the experience and we can do it again. That does not mean that there were no mistakes in the past. As is the case with anything human, we are not infallible; infallibility belongs to God. We have learnt from those minor mistakes and we will take them into account when we return to the government in 2019. There are certain things that PDP will no doubt do differently based on past experiences,” he said. But while speaking to The Nation during the week on how PDP intends to handle the emergence of its next presidential candidate, Senator WalidJibrin, Chairman of the party’s Board of Trustees (BoT), said the PDP is not leaving any stone unturned as it strives to ensure that the party does things right this time. According to him, it is important for the opposition party to avoid the pitfalls of the past. “Take my words for it. I have said this before and it is the true state of things with the PDP. We are working to present the best presidential candidate for Nigerians this time. And like we said earlier too, the PDP candidate will be from the North in 2019. The party’s leadership in the North had already put in place machinery to ensure the emergence of the best presidential candidate from the area in 2019. “All of us as a party have agreed that the President of Nigeria should come from the North in 2019. I enjoin you to support the North to bring and give us capable presidential candidate. We are all doing what we can in the North with all the leaders to identify who is the best candidate to rule this country. The best person that will take power from the ruling party in 2019 is our own, 2019 is for the PDP,” he said. The Nation also learnt that the party is still undecided over the modalities for the presidential primary elections. Party sources say currently, talks are on about either retaining the presidential convention approach or adopting the Option A4 approach proposed in 2016 by the then leadership of the party. According to findings by our correspondents, party chieftains are sharply divided on the matter. It was learnt that while the Option A4 proposal was discussed and approved by the party’s National Working Committee (NWC) in 2016, it was agreed that it should be ratified at a national convention of the party for it to become part of its constitutional provisions. But that was not to be as the issue was neither raised nor discussed at the last convention of the party in Abuja. A chieftain of the PDP and former Publicity Secretary of the Alliance for Democracy (AD) in Anambra State, Arthur Nwoye, while speaking to our correspondent during the week, revealed that there is a growing agitation within the party that the Option A4 system must be adopted for the 2019 presidential primary election. He explained that many party bigwigs are of the opinion that the approach will help the party to do the right thing. “It is true we are considering how to go about the presidential nomination ahead of the 2019 General Election. You will recall that our party leadership proposed the Option A4 as an approach that will help the party do things better. It was widely applauded and supported. Our then Publicity Secretary, Olisa Metuh, took time to educate party members and Nigerians on how it will work. “It was resolved that we go to a convention to ratify the decision of the leadership. We all remember that we were unable to hold convention until the Supreme Court gave its judgement. At the convention, the issue was not raised and we suspect that was intentional. Already, we are seeing that some people are not comfortable with the Option A4 suggestion because it will make it difficult for them to impose a candidate on us. But we are unrelenting in our request for it,” he said. And as the opposition party intensifies its search for a sellable presidential candidate ahead of the next general election, there are indications that the PDP may have decided to spread its dragnet beyond its own shores, into the space of other political parties, especially the ruling APC, in its quest to ensure that it procures a candidate with the right capabilities to help the opposition unseat the ruling party in 2019. Findings by The Nation revealed that many chieftains of the PDP are supportive of an alleged move by some forces within the party to open up the contest for the party’s presidential ticket in such a way that returnees and new entrants into the party would be able to seek and possibly win the ticket ahead of the next election, not minding the time they join the PDP. Sources within the party told The Nation that it is this line of thinking that informed the recent amendment of the party’s constitution to allow defectors and other new members contest elections. According to the National Publicity Secretary of the party, Kola Ologbondiyan, all the new entrants and old members of the party would be allowed to test their popularity during the party’s primaries. “We are not closing our doors to new entrants who want to contest the party’s presidential ticket. Our doors are open to them. We have amended our constitution to take care of their interest as well as those of other members. We are looking for credible people to fly our ticket in 2019. We have amended the constitution, which has now reduced the years that defectors can stay in the party before contesting election from two years to just six months,” he said. The Nation learnt that the PDP is strongly working on some of its former members who left the party for the APC in the build up to the 2015 General Elections, to return to the party and help in its struggle to return to power. According to party sources, it is not impossible that one of such former chieftains being expected to return to the party will be favored to emerge as the presidential candidate of the party in 2019. “For now, the many talks about who will be the party’s flag bearer remain in the realm of mere speculations. I can tell you that the leadership of the party and numerous other stakeholders are daily holding meetings and talking about how to procure the best man for the job ahead. But in arriving at who will lead us to the next political battle as our presidential candidate, the PDP is currently considering a number of factors,” our source added. Checks within the party by our correspondents revealed that party leaders and other stakeholders have been meeting to discuss, not just the modalities through which the presidential candidate of the party will emerge, but also the many things to consider, given the current political realities, chief of which is the fact that the party is now in opposition, seeking to dethrone a sitting President. To go with this are other germane considerations the party will have to take decisions on if it desires to win the 2019 Presidential Election. According to party sources, the party is searching for a candidate who can defeat incumbent President Muhammadu Buhari of the APC. Thus, concerns are being raised about issues like the age of the-would be candidate, his public image, who will be his running mate and how is candidature will help resolve some nagging disaffection within the party, especially in the South-West zone. Although leaders of the party were said to have been considering the issue of age all along as they discussed the various options for the party ahead of the 2019 presidential election, The Nation learnt that following the surprise open letter to President Buhari by former President Olusegun Obasanjo, calling on the former to resign largely on account of old age and performance, and the seeming support given to this call by ex-Military President Ibrahim Babangida, the need for the opposition party to field a younger candidate against Buharihas taken the center stage. And while Nigerians were still wondering how best to handle both Obasanjo’s message and the messenger, Babangida, a very unlikely collaborator, added his voice to the call when he said it is time for his generation to encourage the emergence of a new crop of leaders who are much younger. According to the retired General, the 2019 elections offer “a unique opportunity for Nigerians. “The next election in 2019 therefore presents us a unique opportunity to reinvent the will and provoke fresh leadership that would immediately begin the process of healing the wounds in the land and ensuring that the wishes and aspirations of the people are realised in building and sustaining national cohesion and consensus,” Babangida’s letter read in part. Speaking to The Nation at the weekend, former governorship candidate in Lagos State and a frontline chieftain of the PDP, Remi Adiukwu, said the PDP, like any other party willing to win the next presidential election, is thinking about fielding a younger candidate. This she said is largely based on the need to give the country a new beginning but partly because of the growing calls for a younger leader. “The PDP is peopled by seasoned politicians and technocrats. We also understand what the country needs going forward and there is no doubt that the party is concerned about not offering someone as old as Buhari to Nigerians in 2019. And when you consider the growing calls for a younger leader, you will appreciate the enormous task ahead of the PDP as we decide on who will fly our banner in 2019. “Over and above many other qualities we currently seek in a presidential candidate, the issue of age and good health is central. And as we speak, the leadership of the party is looking closely at all our presidential hopefuls with a keen interest in how old they are and how fit they are for the task ahead. There is no doubt that the PDP stands a better chance in the next election with a man or woman younger than Buhari,” she said. And from the north, where Buhariis still believed to enjoy something close to a cult followership, especially among the commoners and the youths, some voices of dissent are daily springing up to join the call for a much younger leader as 2019 draws nearer. To these people, what is important is for the political players to understand the urgent need for generational shift of power. YerimaShettima, the President of Arewa Youths Consultative Forum and an erstwhile ardent supporter of Buhari’s aspirations, is one of such northern elite who have joined their voices for change in 2019. The pro-democracy activist says he is not particular about which political party should win the next presidential election, but he is interested in seeing a younger leader emerge for the country after the polls. “Our target is to seek opinion of Nigerians to build capacity, consult our southern counterparts to ensure that we come up with a candidate that is younger than the age of Buhariso that at the end of the day, with the support of the youths, we will come to realise the Nigeria of our dream. I took that position long before now, Shettima said while explaining his objection to Buhari’s reelection. Consequent upon these growing agitations, inside sources say the PDP may be forced to place the issue of age over and above other considerations as they seek the next presidential candidate of the party. “There is no gainsaying that if we go to the polls with a younger candidate, we will win the support of many Nigerians across political party divides. So, it will be politically expedient for us to do that,” a chieftain of the party said. There is another factor to ponder on for the PDP concerning who should be its presidential candidate in 2019. This is the South-West zone of the party. Currently, apart from being riddled with pockets of intra party wrangling, the zone is seemingly detached from the rest of the party as it is still nursing the wound inflicted on it and its leaders at the December convention where its numerous candidates were defeated by the lone contestant from the South-South, allegedly contrary to an earlier agreement. Though efforts are on by various organs of the party to bridge the obvious gap, pundits say it is too early to confidently say the South-West arm of the party will swallow the bitter pill it was served at the convention and work for the success of the party going forward. Hence, there is serious talk within the party about getting a presidential candidate that will appeal to the South-West and fasten the process of reconciling its leaders to the mainstream of the party. “It is important for the PDP to consider the preference of the South-West zone in arriving at its choice. 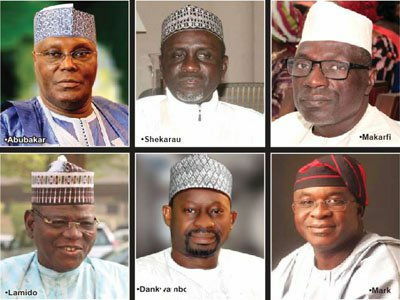 It is clear the zone cannot produce the next PDP presidential candidate but if the party succeeds in getting a northerner in whom PDP leaders in the south have common interest, it will do a lot of good for the party because given the quantum of votes in the zone and its cosmopolitan nature, no serious party can afford to ignore the region,” a party leader said. It was former Director-General of the Jonathan Campaign Organisation, Femi Fani-Kayode that first gave an inkling of things to come during the build-up to the last convention of the PDP when he said the chances of the opposition party in the 2019 Presidential Election are largely hinged on the South-West zone producing the National Chairman of the party at the convention. “One of the things that I learnt at the early stage in this game is to try to avoid a hypothetical question. You are asking me what the reaction of the South-West will be if we don’t get the National Chairmanship. If we don’t get it, then we will cross that bridge when we get there. But I sincerely hope we are not brought to that impasse because it will be very difficult to our people in the South-West which probably has the second largest number of voters in the country. “There was an agreement they would go to the South-West. Some were of the view that agreement no longer binds anybody, and others believe it should remain in the South-West. I believe strongly that it should remain in the South-West for a number of reasons. I believe at the end of the day it will if we are really serious about winning the election in 2019. “In the Presidential election, it will be difficult to explain to them why we don’t have the Presidency and why we would not have the National Chairmanship of the party and why we wouldn’t have the Vice-Presidency and why we would be left with nothing,” Fani-Kayode had warned PDP leaders days before the convention which produced UcheSecondus, a south-southerner as the chairman of the PDP. Shortly after Secondus emerged and the South-West lost the chance to produce the National Chairman of the party, the Chairman of PDP’s National Committee on Reconciliation and Governor of Bayelsa State, Seriake Dickson, said the party would need the full support of its members in the South-West to effectively execute its plan to capture political power in 2019. Dickson, who wasted no time in urging reconciliation and appeasement of aggrieved party chieftains, especially in the South-West zone, said that the PDP would need the support and the wise counsel of leaders in the South-West to succeed in its objectives. He said his committee went to the zone to discuss the issues that were thrown up by the convention. Dickson’s concern, which is shared by numerous other PDP leaders, is not premised on Fani-Kayode’s position alone. Like many others within and outside the party, he would recall that many South-West leaders of the party left no one in doubt that unless the zone produces the National Chairman of the party, its chieftains in the zone will be left to reconsider their continued support for the opposition party. Days before the convention, Chief Ebenezer Babatope had, in his usual blunt manner, spoken on the South-West quest for the party’s chairmanship thus; “I want to make it absolutely clear that if Mr. Makarfi is an honourable man, he will voluntarily resign his position without waiting to be pushed out. His game plan is simply to handover the party to NyesomWike, through his acolyte UcheSecondus. Numerous other leaders of the party are also believed to be disenchanted with the PDP. These include former Deputy National Chairman, South, Chief Olabode George, a former Minister of Works, Senator Adesewe Ogunlewe, Chief Makanjuola Ogundipe, Chief Mrs. Remi Adiukwu, former Deputy Governor of Lagos, Sen. Kowoworola Akerele-Bucknor and former Minister of State for Defence, Erelu Olusola Obada. Also being pacified by various organs of the party currently are Mr. Jimi Agbaje, Otunba Gbenga Daniels, former National Vice Chairman, South West, Ishola Filani, former Minister, Elder Wole Oyelese, PDP chieftain, Othman Shodipe, Chief Makanjuola Ogundipe, Chief Eddy Olafeso and others. Dickson had said no effort will be spared to ensure that these chieftains are reconciled to the party. In a statement showing that progress is being made, Babatope recently declared that, “We have contributed to the party immensely and helped hold it together since its inception. We will not jump from one party to another. Those of us who believe in PDP will never compromise on our membership. The controversy will not have adverse effect on the party’s performance in 2019, especially if a reconciliation mechanism is put in place to address genuine grievances. “The PDP will not suffer in the South-Westbecause of what happened. South-West PDP still seeWike, Secondus and others who denied the region the chairmanship slot as friends.” But the continued silence from the camps of other notable party leaders in the zone remains a source of worry to the promoters of the leading opposition party as they hope to unseat the ruling APC in 2019. If truly Babatope said the above from his mind and he speaks the mind of majority of other PDP leaders in the zone, the party may have finally solved a big problem confronting its 2019 presidential dream. But if otherwise, the PDP must begin to think of the magic it will deplore to get votes in the region during the next presidential election. To make matters worse for the PDP, its state chapters in the South-West are battling lingering intra party crises. From Ogun State where the expulsion of Senator BurujiKashamu by the national leadership of the party is still generating discord while the no love lost relationship between ex-Governor Daniel and Honourable Ladipupo Adebutu divides party members into camps, to Ekiti where Governor AyodeleFayose’s alleged imposition of his deputy as the PDP gubernatorial candidate for this year’s governorship election is daily shredding the party, the PDP is far from being united in the zone. The situation is not different in Osun State. Senator IyiolaOmisore’s governorship aspiration and the stiff opposition to it by some prominent party chieftains across the state has kept the party on its knees even as the national leadership of the party recently ordered a fresh congress to elect a new state executive committee for the party. In neigbouring Oyo State, the former Governor Rasheed Ladoja political family, which recently returned to the PDP from Accord Party, is at loggerheads with ‘old’ members of the party over the control of party machineries. While party leaders in Lagos appear united in their rejection of the treatment meted out to the zone at the December convention, inside sources insist the rivalry between the Bode George and Agbaje camps remains unresolved. And it is likely they will go back to their fighting ways once the burning issues arising from the convention are either resolved or forgotten. And for now, the PDP in Ondo State is not healthy. With former Governor Segun Mimiko yet to get his political groove back after the defeat his party suffered at the last gubernatorial election in the state, and Chief Eddy Olafeso in court against the PDP over the chairmanship of the party in the South-West, it is obvious that the party needs help in the Sunshine state. As the PDP searches for its presidential candidate for the 2019 elections, another major factor that has taken a prominent position is the choice for the vice presidential ticket. Insiders revealed that the slot was initially considered for the South-East, but following South-West zone’s failure to clinch the position of the National Chairman, some forces are proposing a possible South-West candidate for the Vice Presidential job. “The initial idea was for South-West to produce the National Chairman while the South-East will produce the Vice-President. But as part of the reconciliation, some groups from the South-West zone are suggesting that the South-West may also be considered for this job as compensation,” said a source. Another source, a former member of PDP National Working Committee, however faulted this claim, saying that South-East is likely to produce the PDP vice-presidential candidate. “The South-East is likely to produce the Vice-Presidential Candidate. Since our aim is to defeat APC and that party is likely to field Buhari and and his current vice, who is from the South-West, it is wiser for PDP to field a vice presidential candidate from the South-East. That is all I can say. It is more strategic and more realistic, considering all the relevant factors,” he said. Whichever, our correspondent gathered that beyond the issue of the zone that should produce the vice presidential candidate, the issue of the candidate has become very prominent as governors and former governors have filed out for the plum job. This also confirms why it is critical for PDP to get it right.